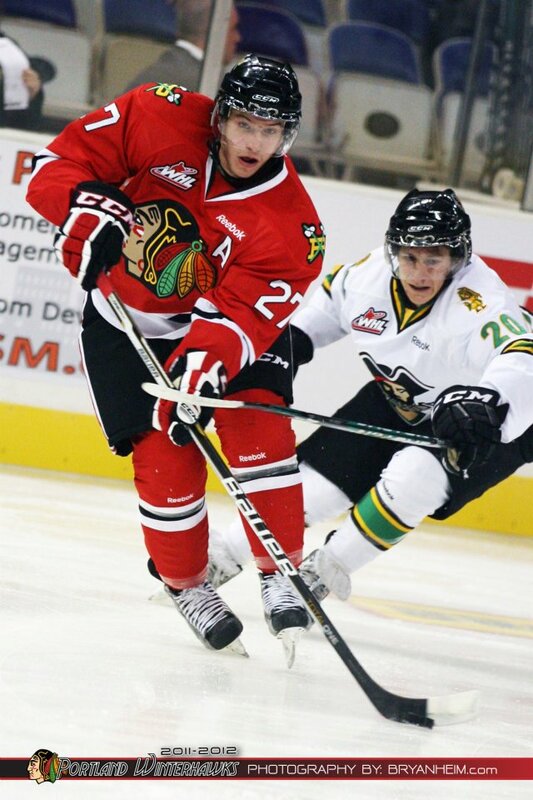 10/7/11 – Everett 4 – Portland 2 – Comcast Arena: The Hawks started out their three-in-three weekend in Everett, falling to the Silvertips 4-2. Everett took command in the first, taking a 2-0 lead on goals by Jesse Mychan five minutes in and a back-breaking power play goal by Ryan Harrison with just under four seconds remaining in the opening period. Portland sandwiched goals by Derrick Pouliot and Taylor Leier around a marker by Cody Fowlie in the second period to trail 3-2 entering the third, but, the Brennan Yadlowski’s point shot found its way home through traffic to provide the final margin. Portland outshot the ‘Tips 42-31 with Kent Simpson making 40 saves for the win while Mac Carruth stopped 27 in the loss. 10/8/11 – Portland 5 – Prince Albert 4 – Memorial Coliseum: For only the second time this season, the Hawks struck first when Derrick Pouliot pounded home a loose puck in the slot on the power play but the the Raiders would respond with goals 12 seconds apart from James Bettauer and Antoine Corbin to take a 2-1 lead. Nic Petan and Jason Trott would score before the end of the first to give the Hawks a 3-2 lead after one. Sven Bartschi would get his first of the year early in the second to make it a two-goal advantage but Corbin would respond on a four-on-four to make it 4-3 Hawks after two. Tyler Vanscourt would tie the game on a power play early in the third but Bartschi would convert a power play of his own for the game winner with just over eight minutes remaining. Bartschi would finish the night with 2-2-4 while Ty Rattie chipped in three assists. Portland hit the 40 shot plateau again, out-shooting Prince Albert 44-30 in the game and it was Brendan Burke picking up his first WHL victory, stopping 26 shots. Eric Williams took the loss with 39 saves. 10/9/11 – Tri-City 4 – Portland 0 – Memorial Coliseum: In the third meeting of the season between the two teams, Portland was looking for their first win against the Americans, but it wasn’t to be as Ty Rimmer stopped all 43 shots he faced to shut-out the Hawks. Justin Feser would get the game-winner on a nice passing play late in the first period and then Adam Hughesman would score three straight (one power play, one even strength and the other into the empty net) for the hat-trick. Brendan Shinnimin would add two assists for the Ams. 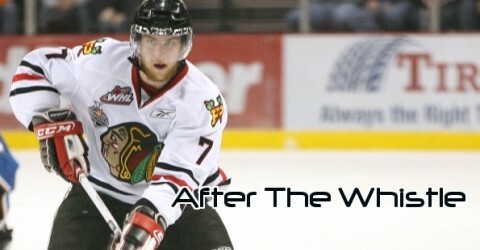 Portland out-shot Tri-City 43-22 in the contest with Mac Carruth making 18 saves in net for Portland. 1. Sven Bartschi – Posted 2-3-5 in the three games and had some glorious chances on Sunday against the Ams. 2. Derrick Pouliot – Posted 2-1-3 in the three games with both goals on the power play. Had a career high three game goal streak snapped on Sunday. 3. Taylor Leier – Posted 1-1-2 in the three games and continues to impress with his all-around play and work ethic. The Hawks have two home games this weekend against non U.S. Division teams as they host the Kamloops Blazers on Friday night and the Brandon Wheat Kings on Saturday night, both games at the Veterans Memorial Coliseum. Kamloops started off 4-1-0-0 on the season before relinquishing a 4-1 lead to the Medicine Hat Tigers on Monday afternoon to fall 5-4. They feature good offense with Brendan Ranford, Colin Smith and Chase Schaber up front and d-man Austin Madaisky. Rookie 16 year old Matt Needham is a high-profile young player and is nearly at a point per game to start the season. The Blazers are carrying three goaltenders still with the lone veteran in Cam Lanigan. Brandon enters the week with a 4-1-0-1 record and will face Spokane on Wednesday and Tri-City on Friday before visiting Portland on Saturday. They are led by 19 year old Mark Stone with 16 points in six games. Michael Ferland (7 goals) and import rookie Alessio Bertaggia (6 goals). D-men Eric Roy and Ryan Pulock are both averaging a point per game. The Wheat Kings have two 18 year old goaltenders in Corbin Boes (former Winterhawks Bantam Draft Pick) and Liam Liston with Boes having played in five of their first six games. Portland has six players playing professionally that are eligible to return this year (Taylor Aronson, Riley Boychuk, Oliver Gabriel, Ryan Johansen, Nino Niederreiter and Brett Ponich), and with their departure, the Hawks have lost 970 man games of experience and 555 career points from their line-up. Since Andy only does one post a week and gives us a recap for the weeks game. I am really going to miss the posts when the Hawks takes the long road trip next week. Hope Todd brings his camera, I always enjoyed those reads in years past. I am a little disappointed with the Hawks start especially with 3 losses to the Tri Cities Americans, with 2 being on the home ice. I am hoping Taylor Peters with a -9 rating and William Wrenn -6 start playing better. I am still waiting for Charles “Chris” Wells to show me something on the ice. Lets hope the road trip brings the team together like in years past. Lots of Hawks need to improve the +/- rating, and get some better scoring chances. The likes have got more than 40 shots on goal, but very little great scoring trys. That was my 2cents worth. GO HAWKS! You know a lot about hockey and are very familiar with the whole transition to NHL/AHL thing. The 20 year olds I get, basically if they are good enough to get signed they aren’t coming back because they can at least get some ice time on the AHL team. Where I’m a little shakey is the whole 19 year old thing. I know they have 9 games before they have to make a decision. I also hear that the player has to PLAY 9 games not just be a healthy scratch, is this true? And if so does it speak to why the Blue Jackets are biding their time with the Johan? I never really expected to see him back at this level but I can’t help but feel being a healthy scratch every night isn’t doing him any favors either. I suppose its probably at least a good thing to get the benefit of the NHL training staff and practice. At any rate what are your thoughts or can you think of other 19 year olds who have gone to their NHL team only to ride the bench so early in the season and what ended up happening to them? Yes, it is true that being a healthy scratch doesn’t count toward the nine games. Regarding Johansen and Columbus, it appears that they are being cautious with his development early in the season. Will they keep him the entire season…I don’t know. I’m sure that being a healthy scratch in three of the first five games wasn’t what Ryan wants, but I’m sure he will do all he can to stay there (and why wouldn’t he?). The most recent case similar to this is Brayden Schenn last year in LA…his situation was a bit different as he was injured for part of the time, but the Kings stretched out the decision to send him back to well into the season. He wound up coming back to Brandon, only to get dealt to Saskatoon and he had a great second half of the year. He was then traded by the Kings to Philly as part of the Mike Richards deal.